Enjoying its North American Premiere at the 2018 Toronto International Film Festival, The Sisters Brothers is sure to be the years most talked about Western. The epic cowboy caper set during Oregon’s 1850s Gold Rush was shot by celebrated French director Jacques Audiard, winner of the Palme d’Or at Cannes in 2015. Audiard successfully brings a European panache to the most American of genre films, weaving together a film that is both frantic and funny. 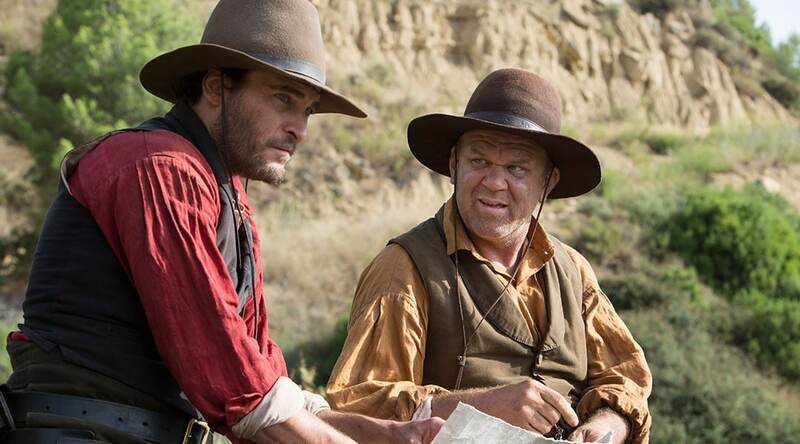 Based on Canadian author Patrick deWitt’s award-winning novel, The Sisters Brothers tells the story of two assassins, Eli and Charlie Sisters (John C. Reilly and Joaquin Phoenix). The notorious pistol-toting duo are contracted by Oregon City crime boss The Commodore to kill Hermann Kermit Warm (Riz Ahmed), a prospector he claims has betrayed him. As they gallop across the Pacific Northwest the brothers encounter an endless parade of hair-raising and hilarious complications including witches, bears, a madman who runs a small town and commands a murderous army of fur trappers, and a detective (Jake Gyllenhaal) tracking the same peculiar man they are. When the Brothers and detective realize the prospector is being hunted down for a secret recipe the unlikely quartet band together in hopes of getting rich quick. The Brothers scheme to screw over their boss once they realize the prospector has developed a chemical solution that when poured in a river reveals the twinkle of gold nuggets below. The stars of the show are the brothers themselves. John C. Reilly plays a sensitive soul who has a fetish for soft shawls and his character serves the majority of the films funny moments. On the flip side Joaquin Phoenix’s brutish character perfectly embodies the toxic masculinity of wild wild west cowboy culture, consistently exasperating his partner in crime with a penchant for alcohol, violence, prostitutes and greed for gold. The Sisters Brothers offers all the trappings of a great Western: jaw-dropping landscapes that romanticize the Sierra Nevada, meticulously crafted sets, gorgeous period costuming, and a script that hits a perfect balance between pistol slinging action and dark family comedy.